When I chose a sunscreen I always go for a Mineral based one. What I’m looking for is one containing either Titanium Dioxide or Zinc Oxide. They are safe and effective and block out both UVA and UVB rays. The mineral particles are big so they won’t penetrate the skin, they sit on the surface blocking the sun rays,and as soon as you put your sun cream on you are protected. Conventional chemical sunscreen contains very small particles which will penetrate the skin and those chemicals will end up in the bloodstream. You also have to wait 20-30 minutes before they start working. 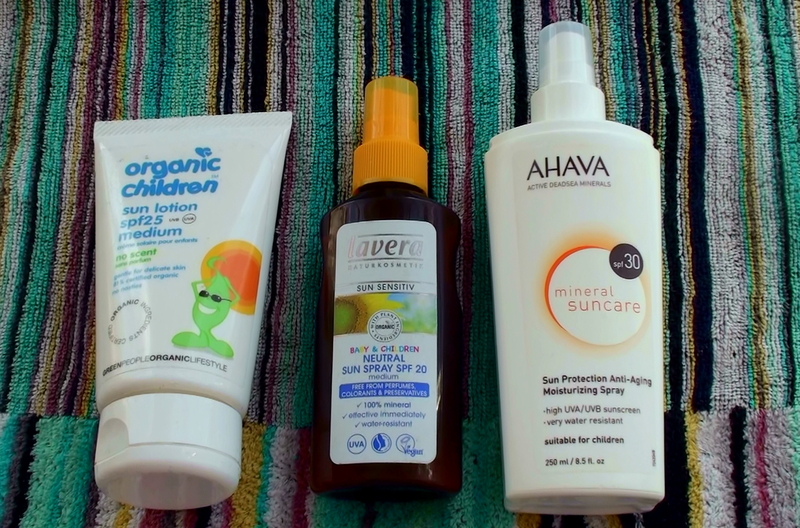 I would never, ever use conventional sunscreen on my kids due to the mix of harmful chemicals they contain. It’s especially Oxybenzone that I look out for, it’s been linked to disruptions to the reproductive system, nerves, thyroid and immune systems. But oxybenzone is by no means the only chemical that seem to cause problems, conventional sunscreens contains a bunch of other questionable chemicals. I strongly belive they should not be used on kids. Everytime you re-apply the cream those chemicals will be absorbed into their little bodies. Yes, Mineral based sun creams are more expensive, the chemical cocktail mix in conventional sun products are far cheaper to produce, and sun protection is big business. Mineral sunscreens also leave a white film on the skin, perhaps not the effect you want when lounging at a chi chi resort! Of course the best sun protection is clothes. When I’m in London or Stockholm I just cover up after I’ve had my dose of Vitamin D enhancing sun rays, so I don’t really use sun protection. When I’m on beach holidays and want to chill out in the sun the whole day, I make sure I’m under an umbrella and then I use a mineral based sunscreen with very little whitening effect, (yes, I’m a bit vain). It also contains some chemicals, but the mineral particles will prevent the chemicals from leaking in and it’s not like I’m on holiday for months on end, we’re talking 2 weeks a year, max.